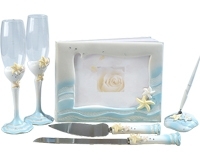 Let your wedding day sparkle with the Crystal Calla Lily Wedding Accessories Set. These items are a special addition just for the bride and groom to use and have as keepsakes after the guests have all gone home. 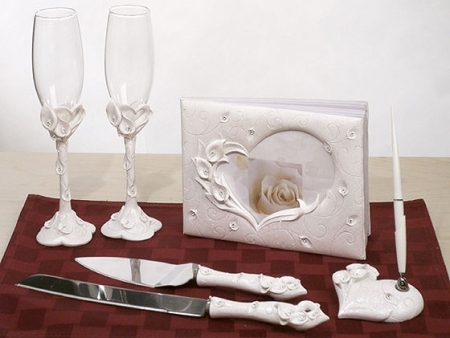 This set comes with all of the wedding accessories that are part of the Crystal Calla Lily collection. 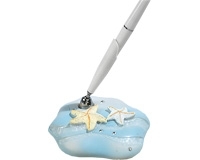 You will receive two toasting flutes, the guest book, the pen set, and the matching cake and knife set. 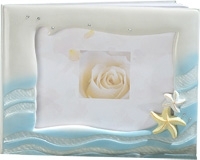 All of the accessories feature a three dimensional calla lily design with multifaceted clear rhinestones set in the center of each calla lily. 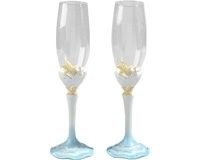 The toasting flutes measure approximately 10" tall and made of glass with poly resin stems. 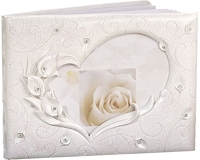 The guest book measures 8" x 6" and it features a heart cutout window on the front that you can slip a personal photo into that will show through the cover. 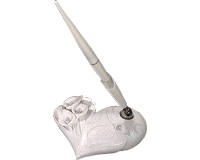 The pen set measures 8" tall with the ball point pen sitting in the heart shaped base. 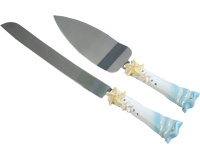 The cake server measures 10.5" and the knife measures 12.5" long. 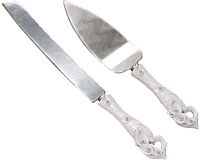 The cake and knife servers are made of stainless steel with poly resin handles. Each element of the set comes packaged in a gift box that you can use to protect the pieces in storage after the reception.